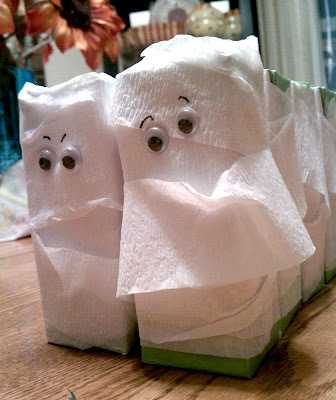 Here is an adorable idea that I stole from a friend, who stole it from a friend, who most likely saw it on Pinterest! Simply wrap the juice box in white streamers and glue on two googly eyes. I'm sharing these with my son's class. They will need to 'un-wrap' them in order to get to the straw!